It is a very popular book on Usability. Steve Krug is a usability consultant who has more than 15 years of experience as a user advocate for companies like Apple, Netscape, AOL, Lexus, and others. 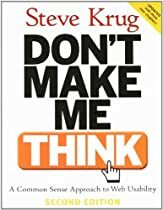 Based in part on the success of the first edition of Don’t Make Me Think, he has become a highly sought-after speaker on usability design. When we design Web sites, we often overlook the simplest things because we’re too wrapped up in the design. After working on Web sites for a while, some of us have slowly moved away from what we know is usable to adding or removing elements that may enhance the `look’ – and also break a site’s usability. Steer back on track with the new edition of Krug’s highly referenced book. Novice, intermediate, expert. No matter where you are on the scale, the book provides value to everyone – even managers, testers and project managers. Management likes to get their hands a little dirty when it comes to Web design projects and sharing this book may make the team’s life easier. Anyone involved with Web design or usability will recognize most, if not all, of the concepts covered in the book. What makes Don’t Make Me Think usable is that it’s a great checklist to ensure you’ve covered all the basics. Krug provides many before and after examples to show how a few changes can enhance a Web site’s usability. The illustrations reinforce the concepts covered as well as how visitors use and read a Web site. As for the differences between the first and second editions, the second addition has three new chapters while usability testing shrinks from two chapters to one and with good reason. The testing chapter breaks down the testing process into digestible steps; complete with a script between the tester (user) and the person watching the tester. Too often, we’ve seen testing get mangled or ignored. With this chapter, teams might find themselves empowered and eager to do testing. The chapter on “Usability as common courtesy” explores how a site can make or break the “reservoir of goodwill” as Krug puts it. We arrive at a Web site with some goodwill and depending on how well the site meets or misses our needs; the goodwill level goes up or down. It may only take one mistake to propel visitors to flee. Another new and short chapter is “Accessibility, Cascading Style Sheets and you.” Krug captures what developers and designers hear when it comes to accessibility and addresses what they fear. He lists five things designers and developers can do make a site accessible without a lot of effort. Finally, the book closes with “Help! My boss wants me to…” Krug has received plenty emails and questions on the topic to identify two questions that repeatedly come up. He provides email examples for free re-use, so no one has to explain it to the boss. It only takes about two hours or a plane trip to read. The writing is conversational, clear and packs a punch with a dash of humor thrown in. Reading the book is not much different than reading fiction because it flows well and the information sinks in without much effort. If you get this book and have the 1st edition, I recommend keeping both. You might find helpful stuff in the original material not found in the new edition.